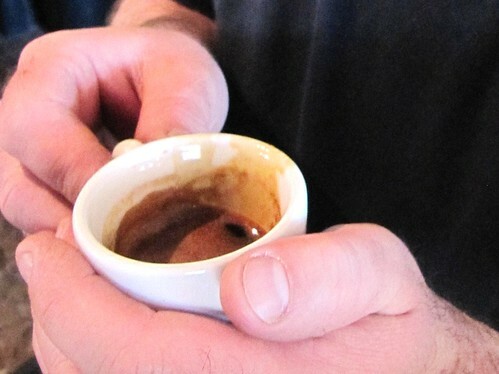 Testing and tasting the new espresso. We just started pulling Eddie’s Fat Guitar espresso, and it’s also available Whole Bean as of now! This rich and vibrant espresso is as thick as poundcake with an eruption of flavor that’s sure to keep Jamie cryin’ for more. A three bean blend of coffees from Brazil, Ethiopia, and Papua New Guinea that texture tones on your tongue. In the cup it’s cinnamon spice, orange peel, and rockin’ rootbeer notes, with brown sugar and honey sweetness. Yeah!